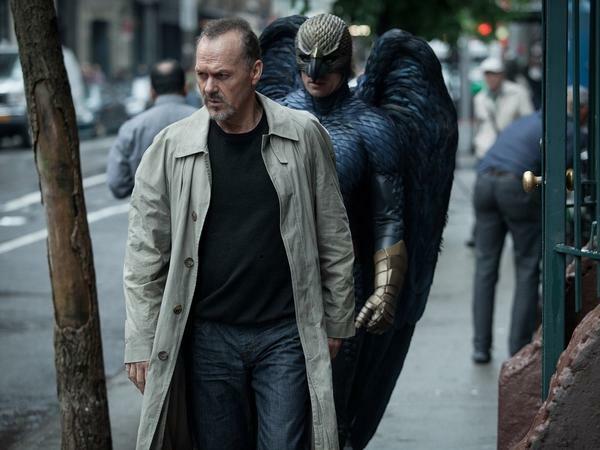 In Birdman, Michael Keaton (a real-life former Batman) plays a former movie superhero who's trying to get a grasp on his career. American Sniper, starring Bradley Cooper, based on the memoir of Navy SEAL Chris Kyle. Boyhood, Richard Linklater's 12-year chronicle of the life of a boy from kindergarten to college. Birdman, starring Michael Keaton as an actor who once played a superhero and attempts a comeback on Broadway. The Grand Budapest Hotel, Wes Anderson's offbeat but meticulously drawn story of a concierge played by Ralph Fiennes and his young protege. The Imitation Game, liberally adapted from the actual life of Alan Turing, the mathematician who broke Germany's Enigma Code during World War II and was later prosecuted for homosexuality. The Theory of Everything, about the marriage and early career of scientist Stephen Hawking. Whiplash, the tense tale of a drummer played by Miles Teller facing off against a teacher played by veteran actor J.K. Simmons. Selma, Ava DuVernay's dramatization of the events surrounding the Selma civil rights marches of 1964 and the development of the Voting Rights Act. Lead actors nominated include Steve Carell for Foxcatcher, Bradley Cooper for American Sniper, Benedict Cumberbatch for The Imitation Game, Michael Keaton for Birdman and Eddie Redmayne for The Theory of Everything. Lead actresses are Marion Cotillard for Two Days One Night, Felicity Jones for The Theory of Everything, Julianne Moore for Still Alice, Rosamund Pike for Gone Girl, and Reese Witherspoon for Wild. On the supporting actor side, the nominees are Robert Duvall for The Judge, Ethan Hawke for Boyhood, Edward Norton for Birdman, Mark Ruffalo for Foxcatcher, and J.K. Simmons — the expected winner — for Whiplash. Supporting actresses are Patricia Arquette for Boyhood, Laura Dern for Wild, Keira Knightley for The Imitation Game, Emma Stone for Birdman and Meryl Streep for Into the Woods. Once upon a time, there were five Best Picture nominees each year. The awards for 2009 expanded the field to 10. But in 2011, the number was adjusted again so that it could be anywhere between five and 10, depending on the way the votes fell. For three consecutive years, this has resulted in a nine-film field; this year, it shrinks slightly. Every year, there is a capricious quality to the nominations that makes it difficult to draw any particular meaning from them, but there are likely to be a few discussion points floating around today in the wake of these announcements. Even for the Oscars — even for the Oscars -- this is a really, really lot of white people. Every nominated actor in Lead and Supporting categories — 20 actors in all — is white. Every nominated director is male. Every nominated screenwriter is male. Shall we look at story? Every Best Picture nominee here is predominantly about a man or a couple of men, and seven of the eight are about white men, several of whom have similar sort of "complicated genius" profiles, whether they're real or fictional. Christopher Nolan's Interstellar, perhaps the most anticipated film of the year that doesn't involve superheroes, grabbed five nominations, but other than the score, they're all visual/sound — nothing in writing, acting, directing or cinematography. The strong showing for Boyhood, with six nominations, and The Grand Budapest Hotel, with nine, is awfully nice for those who like to think you can still get Oscar nominations without throwing your film into the fourth quarter (or, in fact, the last couple of weeks) of the year. Boyhood opened all the way back in August, and Grand Budapest in March 2014, which — for the purpose of this kind of thing — is practically 2012. While the expanded field was once expected to perhaps provide spaces in the Best Picture race for well-regarded blockbusters, kids' films or even superhero movies, that has never taken hold, as it might have this year with something like Guardians of the Galaxy or The Lego Movie. Instead, it seems to provide space for more of the most traditionally Oscar-ish films to make the cut. Wes Anderson is a beloved director for many movie enthusiasts, and this is the first time he's been nominated outside of writing (for Moonrise Kingdom and The Royal Tenenbaums) and animation (for The Fantastic Mr. Fox). Along with Linklater, he's perhaps transitioning from an indie writer admired for offbeat storytelling to a maker of Best Picture contenders. Four of the eight nominees are dramatizations of real events. That's well within range for recent years, as prestige pictures have more and more focused on telling stories with various levels of connection to history. And after 12 Years a Slave, Lincoln and The Help, this makes four years in a row that a film focused on the story of race in America has been in the running. The documentary Life Itself, about Roger Ebert and made by popular documentary filmmaker Steve James, was one of the most-discussed docs of the year, but was not nominated for Best Documentary Feature. (Nominees were Citizenfour, Finding Vivian Maier, Last Days in Vietnam, The Salt of the Earth and Virunga.) It's going to be received as a significant snub, but honestly, if anyone would have known, at least intellectually, not to take it to heart, it would have been Roger Ebert. The extraordinarily popular and well-received The Lego Movie failed to get a nomination for Best Animated Feature against Big Hero 6, The Boxtrolls, How to Train Your Dragon 2, Song of the Sea and The Tale of Princess Kaguya. Gotta say: Nothing against the other nominees, because I haven't even seen all of them, but I can't explain that one. At least they nominated the song, so I, for one, will soothe myself with 85 consecutive choruses of "Everything Is Awesome."